As Ernest Hemingway once said, “A man can be destroyed but not defeated”. A team that was once destroyed in the 1993 Libreville, Gabon air disaster today proved that they can not be defeated. 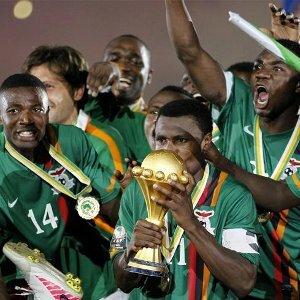 Today, the Chipolopolo team, defeated Ivory Coast 8-7 on penalties to win the 2012 Africa Cup of Nations final after a 0-0 draw following extra time on Sunday. Today, the Chipolopolo team honoured fallen heroes from the 1993 Zambia National Football Team air disaster. Today, the Chipolopolo team crowned Zambia champions of Africa, but winners of the world! Today we celebrate being Zambian! Today we celebrate being champions! Today we celebrate being winners! Zambia: 8 – Isaac Chansa, 5 – Hichani Himoonde, 17 – Rainford Kalaba, 11 – Christopher Katongo, 3 – Chisamba Lungu, 20 – Emmanuel Mayuka, 4 – Joseph Musonda, 16 – Kennedy Mweene, 6 – Davies Nkausu, 19 – Nathan Sinkala, 13 – Stoppila Sunzu and substitute players 12 – James Chamanga, 15 – Kampamba Chintu, 14 – Noah Chivuta, 1 – Kakonje Kalililo, 18 Evans Kangwa, 2 – Francis Kasonde, 10 – Felix Katongo, 9- Collins Mbesuma, 23 – Nyambe Mulenga, 21 – Jonas Sakuwaha and 22 – Joshua Titima. Zambia you made all of southern AFRICA proud. it is very rare that teams from the southern part of Africa do well. keep up the work. i hope all the zambian team good luck for qualifcation for the next world cup. Well done the players and team you will be known as legend in your country. The fisrt penalty at 70min was very unfair to the zambians. Thank God Drogba missed it. The third penalty taken by Bamba (Ivory Coast) during the shootouts was a shame on the linesman and the referees. There was totally no need to retake it. The heart and feelings of the referees were with the Ivory Coast team, but God was for the Zambian team. The referee for this march should be investigated. He didn’t act professionally. Anybody could see that.